It seems like there is certain pattern in writing up reviews and impressions from the performances I have immensely enjoyed – it is much harder and time consuming rather than many good and some average performances required. Also this time has not been different as the only show I have seen twice, and got long-lasting emotional afterglow took much longer time to settle down on paper (blog). 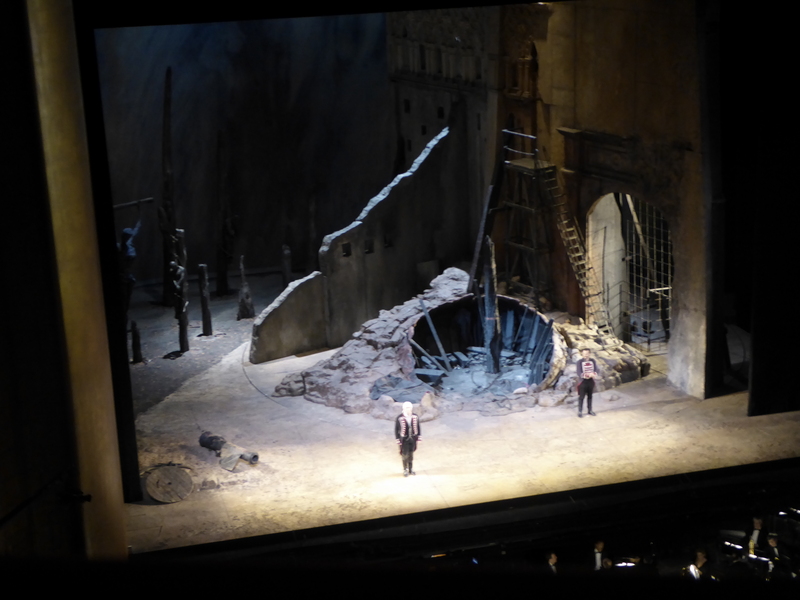 Il Trovatore is one of my all-time favorite operas, therefore I was very excited for the opportunity to see it at The Met with unquestionable all-stars cast, and as it turned out unexpectedly, even twice during my one week long opera holiday in New York. Russian superstars Anna Netrebko and Dmitri Hvorostovsky are very well known to the audiences of The Met as well as #MetHD, and certainly their names attracted many loyal fans appreciating not only their vocal abilities, but also country of origin. Compared to other performances I have attended, those two have brought together considerably high proportion of Russian speaking fans. In addition to artistic qualities and engaging performance to be expected from the top-notch cast, heroic return of Hvorostovsky to sing in three performances of the run created a lot of emotional turmoil and an ocean of adoring and sympathizing get-well wishes, both online and at the house, which resulted in almost disrupted performances on each night him entering the stage. Need to mention, that Hvorostovsky repeatedly proved his unrivaled acting skill, as he reacted naturally and emotionally all three nights in a row – both on burst of applause on his entrance, which forced Maestro to stop the scene for a minute, as well as on surprise of white roses shower at the curtain call. This is just another proof of opera being the most complex form of the theater and performers true professionals both in vocal and dramatic art. Firstly, I would like to note that both performances are incomparable because October 3rd performance was being broadcast live as opening show for The Met in HD 10th season. That was both seen and heard in the theater how focused and disciplined all the cast was – from impeccable singing of soloists till chorus and props movements on the stage. If there was curious mishap on the first night, when occasional bucket, which did not get on turntable during set changes, happened to be on the way of Anna, and she simply kicked it aside, during second performance it was obvious that chorus members are paying extra attention that all components are put in their designated spots in order to keep broadcast flawless. Also there was noticeable improvement of vocal performance of Dolora Zajick (regardless of being mezzo queen and owner of Azucena standard, she had some passagio technique issues) as well as Štefan Kocán, who had minor issue in his opening aria on the first night. Here I would like to stop actual comparison between two performances as on both evenings the creative team and cast delivered their best to create unforgettable show. 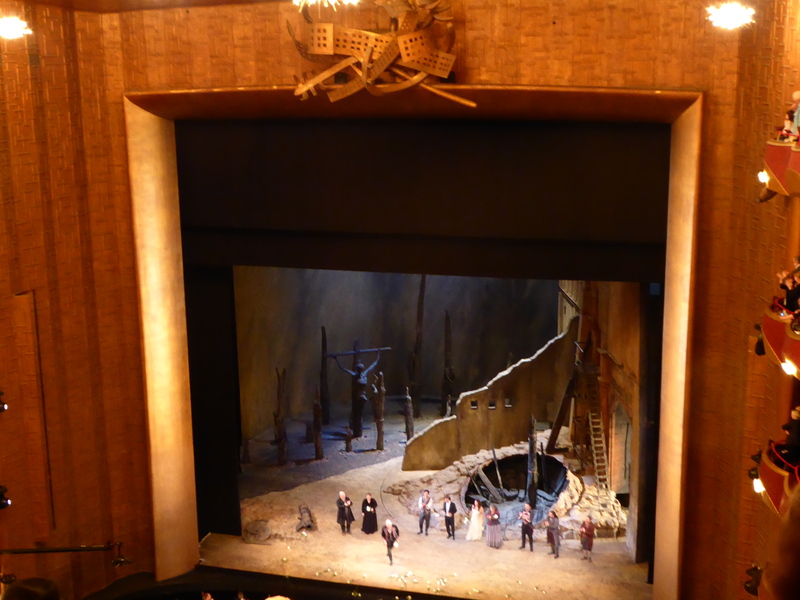 The superstar of the cast was undoubtedly Anna Netrebko, who made Leonora role debut at The Met. I have heard her Leonora recently at Salzburg Festival, and can only continue accolades of compliments and admiration to her vocal and dramatic capabilities. From dramatic perspective, Anna has found new, rich colors in portrayal of her heroine, as the staging in grayish Goya inspired colors and director’s intent demands that her Leonora is strong and decisive character, far from victimized and disillusioned dreamer. 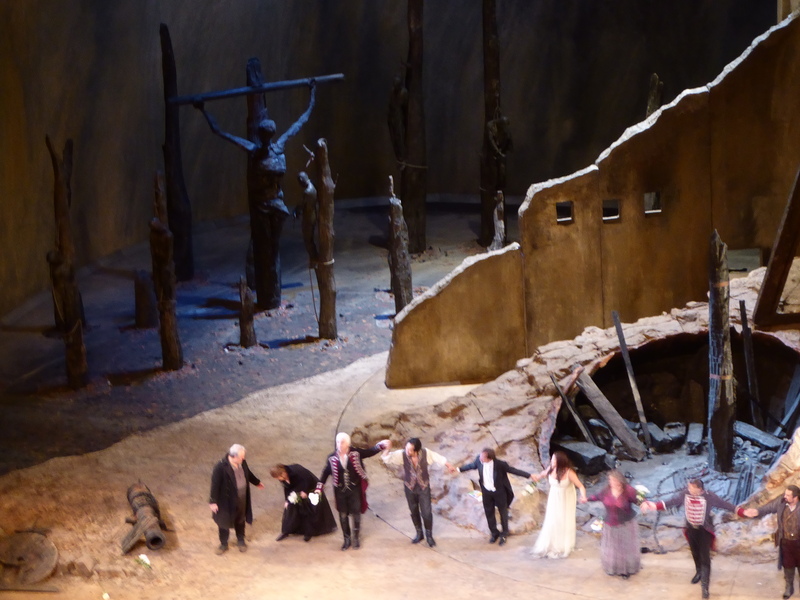 Netrebko found also another aspect in her interpretation of Leonora, now the accent of the role is to unconditional love – if she can’t live for him then she is going to die for him instead. 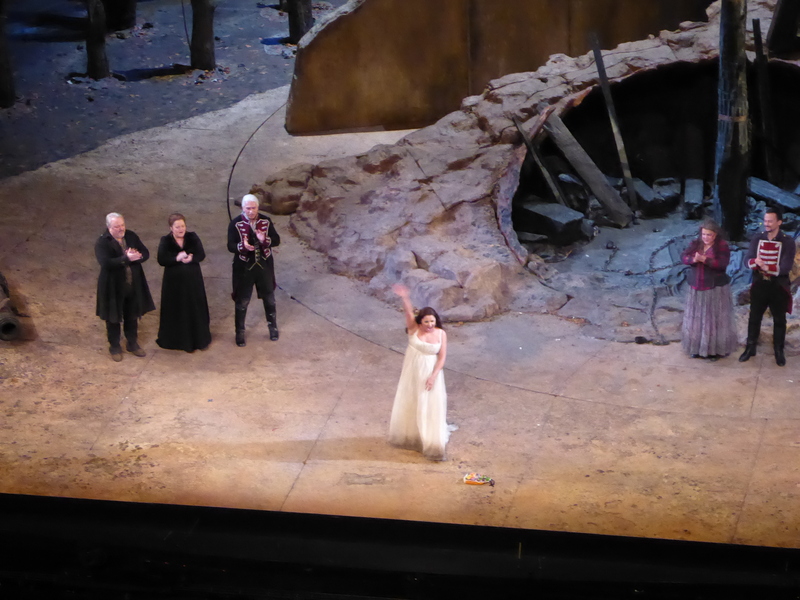 Her delivery of the role was vocally superb (regardless of small phrasing issues in ensemble parts), all arias were sung with high skill and emotional devotion to the character. The only shortcoming of the dramatic interpretation was noticable in lack of intense stage chemistry with Lee. Sometimes it even seemed like her physical attraction and nonverbal clues tended to go for Hvorostovsky’s Di Luna, in such a way confusing the audience if her love for Il Trovatore is so strong as declared. Hvorostovsky delivered decisive and dominant Di Luna, his warmly colored baritone added some more fragility to the inner drama, and a few encountered issues were well timed to add to the the plot of the count great except 2 small episodes where his leading voice was lost – hard to understand if due to orchestral or vocal challenges. His personal drama certainly raised emotional involvement of the audience both in house as well as on the broadcast. Lee is becoming as potentially leading tenor of the new generation, he has big voice, very ling breath, while still has to work towards intonation and dramatic depiction of his character: acting has come as bit schematic and following trained pattern, some more authenticity would have been needed. From audience perspective it seems that his Manrico does not show passion towards Netrebko, he is bit detached, cool and contained. Vocally stable performance and surprisingly good handling of problematic notes, those come with ease. The best scenes for Lee was Manrico together with Azucena, where it was obvious that they have energy and passion flourishing on stage. Dolora Zajick as Azucena delivers perfect role immersion. Her acting is superb, and regardless of 25 years singing the same role at The Met she still has new colors to tell us the story of sacrifice and revenge, with frightening force when using her lower register voice. Stefan Kocan as Ferrando had great intro with his rich bass, creating colorful story and warming audience up to the following events. At the stage door after performance Anna looked beautiful and very kind to all fans, at the moment when people were becoming too pushy she easily regained control with clear re-establishment of the order, commanding the queue and being very friendly at the same time. 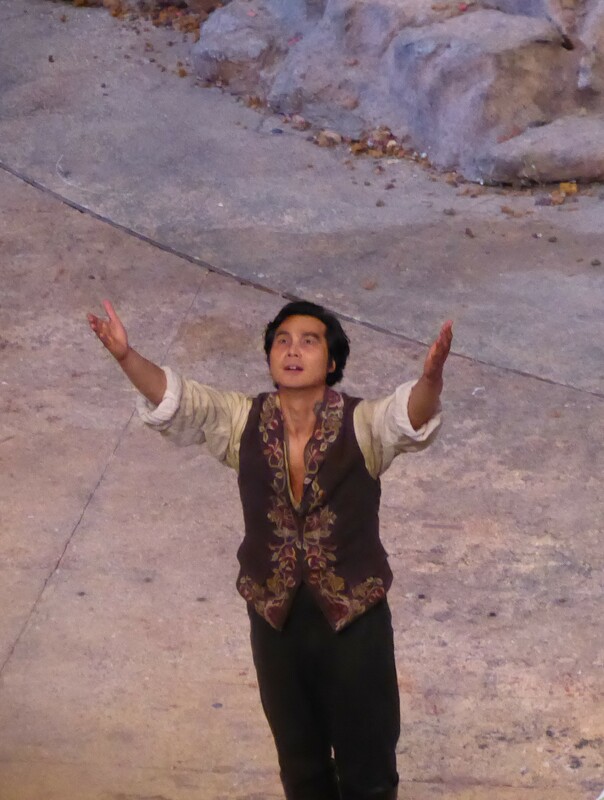 Dmitri was visibly tired after performance and asked fans to move away from proximity of stage door to the driveway. Some fans were behaving too harsh and that probably made him more irritable, giving out bit angry comment to one Russian speaking fan. Marco Armiliato came out dripping sweat but smiley, happy and super friendly with fans. When he answered my thanks for performance with genuine – thanks to you for coming and supporting us, – it sounded very true and sincere, that almost on the spot I have made decision to come back to The Met either late this season or again at the opening of season 2016-2017. Hope for many happy returns!